We never started an article as well, but make a note of this name: Mauricio Lemos. We were literally amazed by this player. Young, born in ‘ 95 but play commanding the entire defense, intercept, anticipates, a perfect Defender. 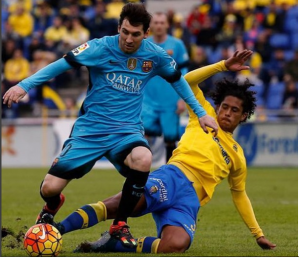 Is climbing the limelight thanks to the excellent performance achieved by the Las Palmas, revelation team in La Liga. You know it’s definitely for Boateng and local football, and two former Livaja but we have started to fall in love with this Uruguayan with curls. Physique, 1 meter 90, unbeatable, perhaps not very fast but with one foot from 40/50-metre launches pure midfielder looking for his teammates. Does the strength and tenacity its strongest points, a very difficult to deal with, so much so that Messi and Ronaldo did really struggling against this young star. He claims to be inspired by Diego Godin, we instead the approach another internationally renowned Defender David Luiz. May one day, Mauricio Lemos, becoming a pillar of Heaven and be admired and appreciated just as the Brazilian champion?